Home » Tea & Coffee Makers » Which is the Fastest Brewing Coffee Maker? If you’re the kind that gets impatient while waiting for coffee to brew, it may be time to get a home coffee maker that does the job fast but still gives you great tasting coffee. You have to keep in mind, however, that sometimes speed is not a good thing and some coffee makers will give you weak coffee because of it. Of course, the more number of cups of coffee a machine makes, the longer it will take. So, which is the fastest brewing coffee maker you can buy that won’t sacrifice on taste? To answer that, let’s first look at how brew time affects your coffee. Quality of coffee depends a lot on the time that water is in contact with the coffee grounds. In the French Press method, keeping water in contact with grounds for too long can result in over-extraction and a very bitter brew. That’s why a manual press uses just around 2 minutes of water contact time. For this article, we’ll assume that you’re not here looking for a manual coffee maker, as that means you have to tend to the brewing process throughout and is probably not what you’re looking for in a fast coffee maker. Most home brewers are the automatic drip kind. In this method, hot water is poured into coffee grounds and coffee is filtered through into a cup or carafe below. You have a water reservoir, a heating element, a filter basket filled with coffee and a shower head that dispenses water on the grounds. Coffee connoisseurs say that there should be an initial dripping of water onto the grounds before the main shower to allow them to “bloom” and release the maximum possible flavor. The Specialty Coffee Association of America has strict requirements for water contact time with coffee grounds in home brewers. This should not be less than 4 minutes or more than 8 minutes. However, many users say that there are some brewers that are faster than that but still make great coffee. We’ve selected a few brewers that are fast and highly rated by their users and a few of them are also certified by the SCAA. Read on to see what they are! The Bunn NHS Velocity 10-Cup Home Coffee Brewer promises a full pot of coffee in 3 minutes or less and it really delivers the goods. It is a variable brew machine, so you don’t have to make a full 10 cups, but regardless, with the NHS Velocity, you’ll get 10 cups faster than you would 1 cup in a regular drip machine. The technology to do this lies in the constantly heated water tank in the back that must be kept full. These 2 round cylindrical tubes keep the water heated to 200 degrees, and when you add cold water in the front reservoir, that super hot water mixes with the cold water to give you the perfect temperature of coffee. The pressurized spray nozzle covers the entire basket of coffee grounds, so you’ll get maximum flavor in every cup. There are a few design changes you’ll see this is newer NHS model. One is that the reservoir lid swivels to the side instead of flipping up, so you don’t need extra cabinet clearance on top just to fill it up. The second change is the carafe spout design that now doesn’t cause spills while pouring. The glass carafe can be kept warm if it is left on the ceramic warming plate with the switch in the ON position. Of course, keeping heated water constantly ready to go is not the most energy efficient way to make coffee, but it sure does work well for making coffee in 3 minutes. It comes with a 3 year limited warranty, and Bunn is known for their excellent customer service. However, be aware that for the first few times you use it, and as the unit breaks in, there may be a slight plastic smell that is completely normal for this product. 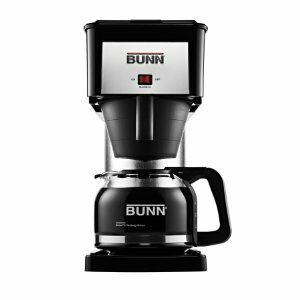 The Bunn BXB Velocity 10-Cup Home Coffee Maker works in the exact same way as the Bunn NHS above, but it has a more traditional drip coffee maker style. This is the one you’re looking for if you want the fastest coffee maker for home use that’s also rated very highly in general. The stainless steel water tank is totally integrated into the overall coffee maker design, and unless you know better, you’d think that it’s a regular drip unit. But it will make up to 10 cups of coffee in 3 minutes or less, and the high pressure spray nozzle shoots hot water out and ensures that all of the grounds are equally covered in water for the best coffee taste imaginable. The Bunn BXB features a brand new dripless glass carafe, and like every Velocity model from Bunn, it comes with a 3 year limited warranty. Customer service from Bunn has always been first rate, but like the above velocity unit, expect a plastic smell from the unit during the break-in period, for the first few times you use it. And because it stores hot water, this is not the most energy efficient unit on the market. With no standing hot water tank, you’ll still get a full 8 cup pot of coffee in about 5 minutes with the Bonavita BV1900TS Coffee Brewer. Operation is simple with just a one-touch button and an auto-off feature. We have also ranked it in our list of top drip coffee brewers. The stainless steel insulated carafe will keep your coffee hot without using any more energy. It is also Specialty Coffee Association of America certified, so you know you are going to get a great cup of coffee. The flat bottomed filter basket and the large shower head are good for complete saturation of the coffee grounds. This machine looks more like a traditional drip coffee maker than many of the others, and you can choose the 30 second degassing and blooming feature for the most flavorful coffee, or for a bit speedier brew, choose to leave that function off. The pre-infusion feature is a bit complicated to use at first, so read the manual to learn how to use it. It uses a 1500 watt heating element, the highest wattage rated here, to get the water up to the perfect temperature of 195 to 205 degrees F and it comes with a limited 2 year warranty. If certifications about wonderful coffee flavor is the name of your game, the Moccamaster KBT 10-Cup Coffee Brewer has the most of them, with certifications coming from the specialty coffee associations of America and Europe (SCAA/SCAE) and the European coffee brewing center’s (ECBC) seal of approval. Of course your taste buds will be the ultimate judge, but with all of these seals of approval, you can’t go wrong if you get a Moccamaster. This home brewer is not only fast but also makes our list of top rated drip coffee makers. This is the largest coffee maker on the list, but it also might have the most interesting design as well. The thermal carafe is insulated, so your coffee will stay hot without using extra energy, and you’ll be able to brew a full or half carafe in about 4 to 6 minutes time. This computer controlled marvel will de-gas and bloom your coffee grounds before infusing them with pressurized water at the perfect brewing temperature that will always be between 196 and 205 degree F. There is no standing hot water tank, so this is an energy efficient unit, and it speaks of durability with a solid 5 year limited warranty. It is also the highest priced coffee maker here, but if you want the certified best of the best, and are willing to pay for it, none will brew coffee better than a Moccamaster. The OXO 9 Cup Coffee Maker brews an entire pot in about 7 minutes. Technically, this machine makes one of the best tasting coffees on the list, as it is certified by the Specialty Coffee Association of America. Of course, coffee taste is completely subjective, but there is no doubt that the OXO does make a fine cup of coffee. This is a computerized model that starts and stops the brewing process to first “bloom” the grounds, then to brew slowly and at the most precise temperature. You fill the reservoir, dial in how many cups you want brewed, and the coffee maker does the rest. The spray head completely saturates the coffee and the elegant design is the most modern looking here. It comes with a 2 year limited warranty, and an insulated stainless carafe. There’s another, relatively new coffee maker that merits a place on this list and that is the Ninja Coffee Bar Thermal Carafe System. It is everything an avid cafe goer would want in a home machine because of the types of hot and cold brews you can get with it and it can brew an entire carafe in about 6-7 minutes. From the most famous coffee brand the world over comes the Mr Coffee BVMC-PSTX95 10 Optimal Thermal Coffee Maker. This is the least expensive fast coffee maker on this list, yet some say that it makes the best tasting coffee they’ve ever had. This unit is an incredibly full featured machine that features such things as an “auto pause,” so you can take one cup of coffee during the brewing cycle, a chlorine filter that filters out 97% of the chlorine so that regular tap water will brew as good as distilled water, and a removable water reservoir that can be taken separately to the sink for filling and washing. Better still, it incorporates an automatic cleaning function that actually removes hard water deposits and build-up. It has a thoroughly modern design, and the insulated stainless carafe keeps coffee hot for hours without a heated base plate. You’ll brew a full pot in 7 minutes, and with all of the features and the lowest price, this must rate as the best bang for the buck coffee maker on this list. It comes with a 1 year limited warranty. There is another smart version of this model that uses the Wi-Fi-enabled WeMo automation app to control its operation even when you’re not at home or in another room.